Feline asthma symptoms can be different for each cat, and recognizing these signs can help you ensure that your cat receives the proper treatment and does not experience respiratory arrest. Sneezing in cats can be caused by asthma, or it can be a sign of many other problems such as a respiratory infection, a virus, and even an eye infection. 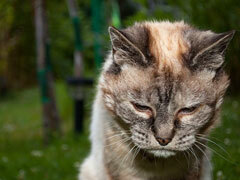 Coughing is another sign that your cat may be having a problem with asthma. If this goes on for more than a few minutes your vet should be consulted. Feline asthma symptoms can also include rapid breathing, which is anything faster than thirty breaths a minute. Cat illness symptoms from asthma may include squatting in a position with shoulders hunched, and this may be accompanied by coughing or excessive mucous production. Open mouth breathing is also common during an asthma attack, and gagging or wheezing are other signs. Feline asthma symptoms may be mild or extremely severe, and some cats may only need occasional treatment while others will need daily care and medication. If your cat has this condition and you have a cat health insurance policy then the treatments may be covered at least in part. Without any insurance coverage you will have to pay for office visits and medications out of your own pocket, but the difference that treatment can make to your cat is amazing. Feline asthma symptoms can include a bluish color in the gums and lips of your cat, and this is caused by a lack of oxygen because of the inflammation. If your cat seems to be struggling to breath or having severe respiratory problems then you should take the animal to an emergency vet immediately. Without proper feline asthma treatment your cat could end up dying, and this can be prevented if medical care is sought early on. Any symptoms which seem severe should be evaluated by your vet.